Do you remember seeing this live on CNN the morning of the terrible shooting at Sandy Hook Elementary School in Newtown, Connecticut, on December 14, 2012? 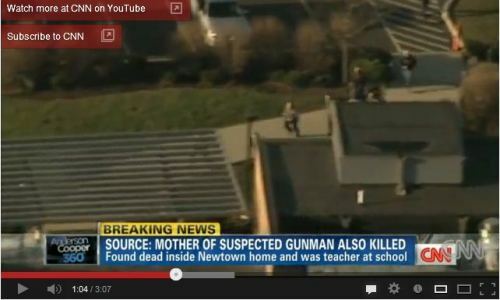 Indeed, the screenshot above (CNN #1) looks like the Sandy Hook Elementary School in Google Maps’ aerial view. 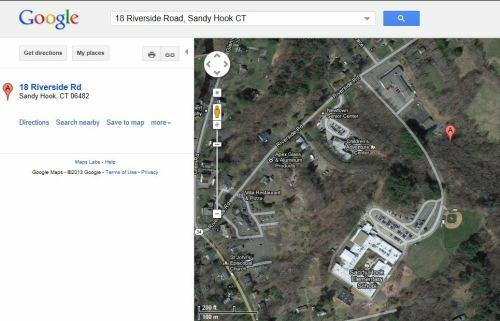 (Address of SHES is 12 Dickenson Drive, Sandy Hook, CT 06482.) Below are two screenshots I took of aerial views of SHES on Google Maps. 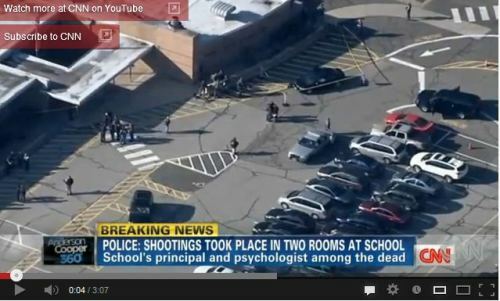 Just to make sure, I’ve placed CNN #1 and Google #2 side-by-side, showing the two are consistent, i.e., CNN’s aerial view of what it claims to be Sandy Hook Elementary School at the 0:04 mark in the CNN live news video indeed is SHES. Please take a good look at the above side-by-side images of SHES. Note that there are no grassy areas or any tree or shrub in front of the school. Instead, the ground in front of Sandy Hook Elementary School is all paved cement. For that matter, it’s not just SHES’s front door that opens onto cement paved ground. Look at Google #2 again: The outside of the entire length of the front of the school building is paved cement — no grassy patch, no tree. The same with the ground surrounding the entire school complex, which you can see for yourself by scrolling up to Google #1. 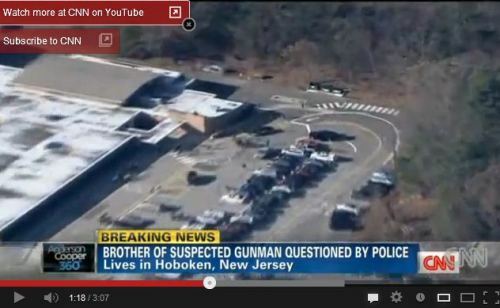 Notice the grassy patches, shrubs, trees, and rounded curb area in front of what’s supposed to be Sandy Hook Elementary School in CNN #2 and CNN #3. How can this be? 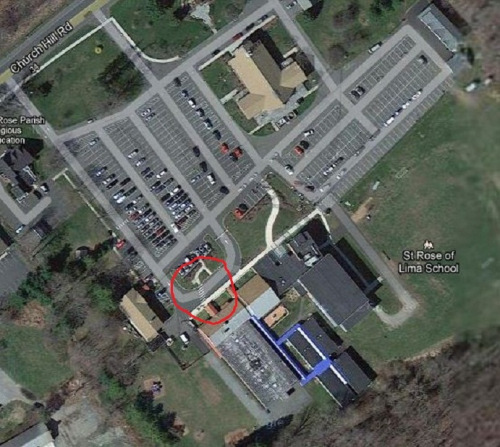 — since we’ve already determined that the ground in front of (and all around) Sandy Hook Elementary School is paved cement? 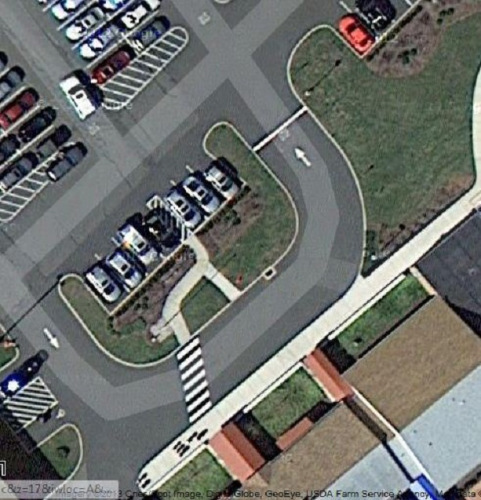 Now let’s look at Google Maps’ aerial views of a nearby school in Newtown, Connecticut, 1.4 miles west of Sandy Hook Elementary School — the St. Rose of Lima pre-School (SRLS) that’s attached to the St. Rose of Lima Catholic Church. Its address is 40 Church Hill Rd, Newtown, CT 06470. Do you see the grassy areas and the curved curb — as in CNN’s footage of the running police officers (CNN #2, #3)? In other words, the CNN footage was of police officers running (most likely) into St. Rose of Lima School, not Sandy Hook Elementary School. But CNN wants you to think the police officers were running into the Sandy Hook school. Why is that? 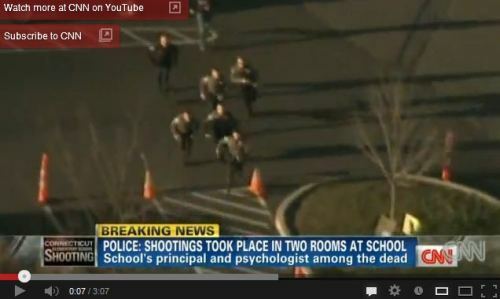 According to an article on Intelhub, the footage of police officers running in the parking lot (CNN #2 and #3) was actually taken at St. Rose of Lima School during a drill: “It is unconfirmed at this time if the footage is from a previously filmed drill or an actual realtime drill that was taking place simultaneously with the reported shooting” at Sandy Hook Elementary School. I tried to verify that St. Rose of Lima School indeed had a school-shooting drill by going on the school’s website. On the “News” page is this message: “Newsletters Are Located on Classroom Webpages.” Alas, when I went on the “Classrooms” page, it’s empty! What I can verify is that the federal government’s Department of Homeland Security (DHS) conducts HSEEP drills/exercises across America. HSEEP (Homeland Security Exercise and Evaluation Program) is a capabilities and performance-based exercise program which provides a standardized policy, methodology, and terminology for exercise design, development, conduct, evaluation, and improvement planning. In the State of Connecticut, HSEEP is conducted by the state’s Department of Emergency Services and Public Protection (DESPP). 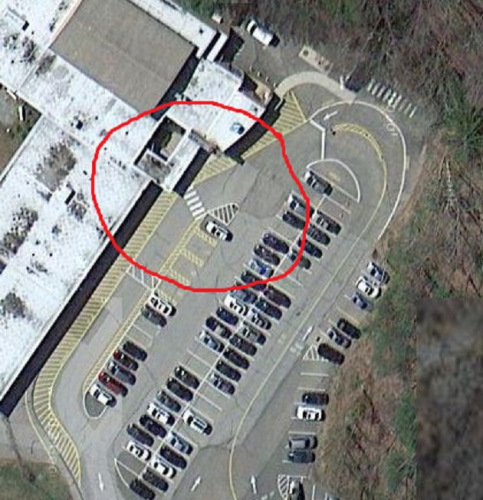 On September 22, 2010, from 8 am to 5 pm, HSEEP conducted an emergency “training course” at the Sandy Hook Fire Department, 18 Riverside Road, Sandy Hook, CT.
That address (18 Riverside Road) is right next to — guess what? 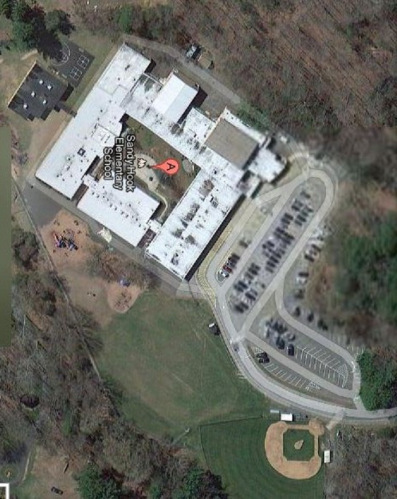 — the Sandy Hook Elementary School! Here’s a screenshot from Google Maps showing the Fire Department is right above to the right of SHES (Google #7). On the day of the shooting massacre at Sandy Hill Elementary School, Sept. 14, 2012, HSEEP conducted another “training course” drill in Connecticut. ”FEMA L-366 Planning for the Needs of Children in Disasters,” at 2800 Main Street, Bridgeport, CT, which is about 14 miles from SHES. H/t Shepard Ambellas of Intelhub, Advent of Deception, and Before It’s News.